I ran Socks with a few mares to keep him in peace as he was pacing the fence & leaving a trench. Little did I know that Socks had eyes on another mare which was running with my piebald stallion Merrylees Nuggett in a field at the other side of the loch - he must have exceptionally good eyesight, hearing & smell!! The next thing I knew was Socks herding his mares into the loch & swimming with them to the other side to be met by Nuggett & his ladies. Nuggett was not impressed with Socks invading his turf so the battle commenced. I couldn't bear to watch, so promptly got a halter & lead rope. After a moment, the halter was on Socks but the fight continued regardless but eventually got him through the gate & into the stable where his wounds were tended to & he felt sorry for himself for a few days. Thankfully all healed up well, just some battle scars remain. Socks passed his Voluntary Veterinary Examination with flying colours. Yippee!! 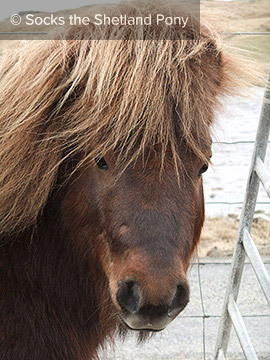 He's a fully registered 32½" stallion with the Shetland Pony Stud Book Society. No holding him back now! !